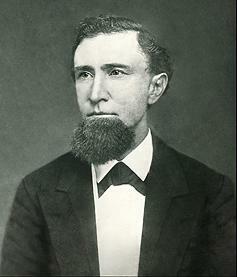 [John Montgomery came to the Ojai Valley in 1874 as part of the valley’s first real estate boom. The first Ojai boom was primarily the work of Royce Surdam, a local businessman who subdivided the town and sold its first lots. John Montgomery’s house was on Matilija Street. Montgomery Street is named for him. Surdam’s plat for the new town of Nordhoff (1874). from the creek at Nordhoff west to the present Meiners property. From this tract he selected a town site, named it Nordhoff and had A.W. Blumberg start a hotel, a free transfer of twenty acres being an inducement. In the spring of 1874 this solitary building was completed; and on a windy night in April a select but limited circle inaugurated the grand opening to the strains of a Ventura band, with choice selections from the repertoire of a coyote troop in the woods outside. Surdam was so enthusiastic over his new acquisition that he could think, talk or dream of nothing else. In place of a portrait of his charmer he had a gorgeous map of her lineaments, with all the embellishments his fancy could bestow, namely: a grand public square with fountain and diverging avenues; a town hall; academy, location for a chapel; and vast possibilities. The writer will never forget his fruitless search for these attractions on his first visit to Nordhoff, and the bewildering confusion of mind resulting from their absence. Surdam had his headquarters at the Santa Clara Hotel in Ventura; and there the unwary stranger, whether Jew or Gentile, was entrapped and like the youth in the Ancient Mariner was held spellbound to hear the story of the beauty and virtue of the new acquisition. A cure for all the ills that afflict humanity, from relapsing fever to impecuniosity, was guaranteed to the fortunate guest or investor in the charmed groves of Nordhoff. Don Quixote sallied forth on the highway to challenge to mortal combat any man refusing to own his Dulcinea the peeress of every lady in the land; Surdam had neither lance nor sword, but not the less emphatically did he insist that all should acknowledge the marvelous superiority of his mountain enchantress. Let no one suppose the man was insincere; he believed every word he said; he was an honest enthusiast with the boom fever in his marrow. There are many now in the valley who would champion its cause with all the ardor of its first boomer. Is she not the ever youthful bride he imagined her to be with perennial orange wreath adorning her lovely crest? Has she not the magic balm of health he promised to all her votaries? Are not the diverging avenues, the grand square, the academy and the public fountain among the probabilities, nay the certainties of the near future? Whether he exaggerated or not, the fact remains that to Surdam the valley owes its first boom: his persistent praise called attention to its beauty, its excellence; and many who would have passed to other points in search of health or homes were induced to cast anchor in the romantic haven so warmly recommended. So successful, indeed, were Surdam’s efforts that lands east of the town advanced in a few months two hundred percent, jumping from ten to thirty dollars an acre. Additional accommodations were soon necessary to harbor the throng of home and health seekers who came into the valley, so that McKee’s canvas tent was transformed into an attractive building, under the appropriate title of Oak Glen Cottage. While Surdam insured success to the valley, he himself in his personal speculation failed to meet the success he anticipated and that his energy deserved. People did not want narrow town lots when broad acres were to be had so cheap. Then he refused to subdivide his outside lands and held them at a high figure, and thus others profited by his efforts while he himself reaped little or no benefit. His expenses were heavy; livery teams, surveying and advertising were sapping his means; and the purchase money had to be forthcoming. He held on so long as he was able; but thee came a day when, with a heavy heart, he parted with his idol. 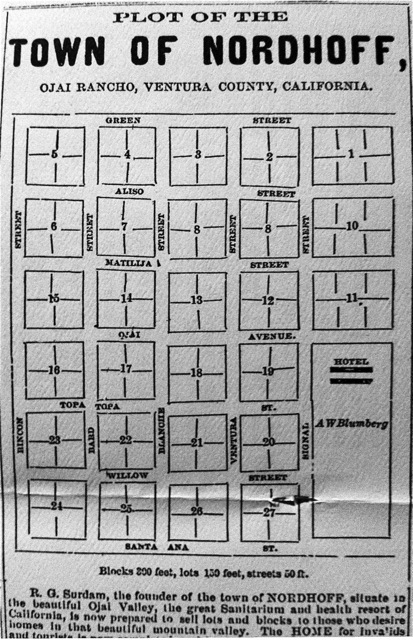 In December 1874 the writer acquired his outside tract of 1,300 acres; and shortly after Colonel Wiggins purchased the townsite, also the Blumberg Hotel, improving the same by adding the west wing. For nearly 12 years the boom virus lay dormant in Surdam’s system to break out afresh in the excitement of 1887 when he undertook to float the Bardsdale property. On this occasion he displayed some of his old spirit, but it never reached the acme of his first craze. Poor Surdam, prince of boomers, to think that all should end in an overdose of morphine and a coroner’s inquest! The promised railroad did not materialize in San Diego, but fine buildings and substantial improvements did; and Santa Barbara owes the Arlington, the Clock Building, Odd Fellows Hall, etc. to the boom of 1873. It died hardest in Santa Barbara, but in 1876 the fever was over, and the languid patient had scarcely strength left to raise a small mortgage. The Ojai Valley, on the contrary, held its own. Whatever start it got in the excitement it retained. It had its wet years and its dry years; barley would lodge and wheat rust. Noisy croakers would wander off Jason-like in search of a golden fleece, lose their husky voices on the trip and return speechless as to the defects and drawbacks of the valley; but the majority of the substantial residents continued nestling in contentment and somnolent in the feeling that life’s aims were attained.